This article originally appeared on The Trek, which can be found here. 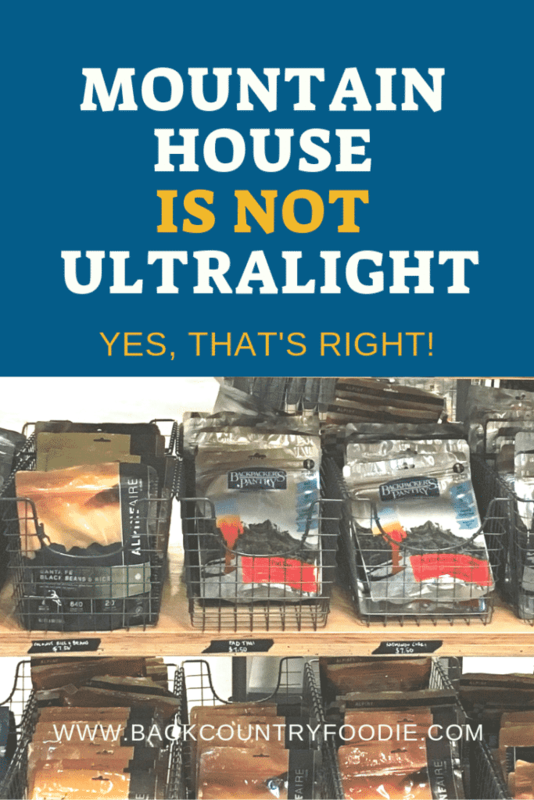 How do you define ultralight food? Thru hiker calorie needs far exceed those of the weekend warrior. It’s difficult to even estimate calorie needs for such treks as most are unable to put in the amount of trail time prior to leaving for their thru hike. One, however, can estimate calorie intake on a day to day basis and for weekend trips. Keeping in mind that it is possible that calorie intake for a thru hike can double typical daily intake and reach upwards of 5000 calories per day. The thru hiker gold standard for food weight is two pounds per day at typically 100 kcal/oz. When reviewing calorie content of commercially prepared food I quickly realized that meeting my 5000 calorie goal would be harder than expected. 5000 calories at the typical 100 kcal/oz = 3 lbs 2 oz daily. This is a weight savings of nearly 8 lbs when carrying a week’s worth of food! The numbers above are useful when reading food labels and determining if the chosen food meets the calorie goal set. Be sure that you multiply the calories listed by the number of servings the package contains. Packaging can sometimes be misleading. Companies often state that the package contains up to 2 1/2 servings when in fact it equates to one thru hiker serving. Take this number and divide by net weight to determine the calories per ounce (kcal/oz). Many hikers repackage commercially prepared meals into ziploc baggies as the packaging itself is over-sized and quite heavy. Some foods will appear as if they are ultralight by the calorie per ounce ratio but require the purchase of two meals to equate to the same calories of a lower calorie per ounce meal. This doubles the amount of money spent and likely equates to the same weight as a single packaged meal. Those tricky manufacturers! Now that you’ve chosen a calorie goal and shopping for ultralight foods, what does this look like in terms of weight? Let’s say your estimated calorie goal is 3000 calories. If consuming ultralight food at 150 kcal/oz your daily food weight will only be 1.25 pounds. Lucky you!! Jumping on the ultralight trail food wagon yet?!? 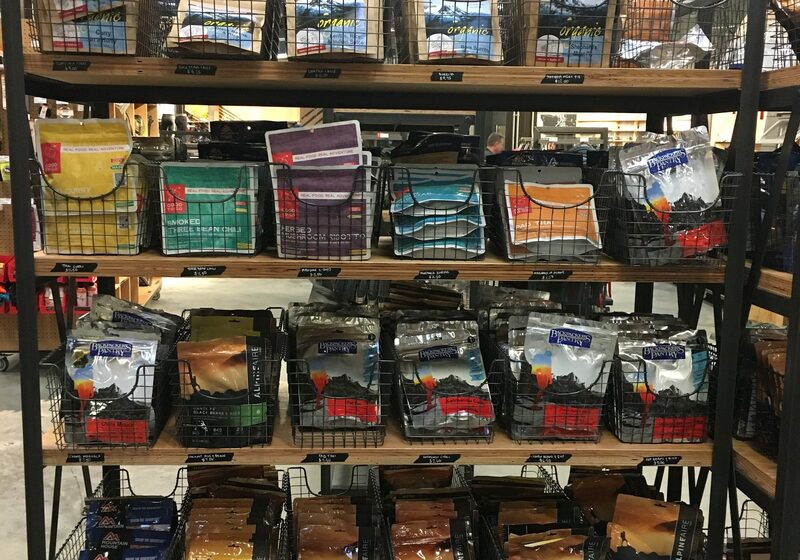 An extensive review of commercially prepared trail food can be found in the files section of the Backcountry Meal Planning for Thru Hikers Facebook group. The review not only includes calories but also the protein, carbohydrate, fiber and fat content of food. Nutrition content of such foods and relationship to hiking performance will be discussed in future posts. Water required to prepare such meals is also something to be considered and will be discussed in upcoming meal planning posts. 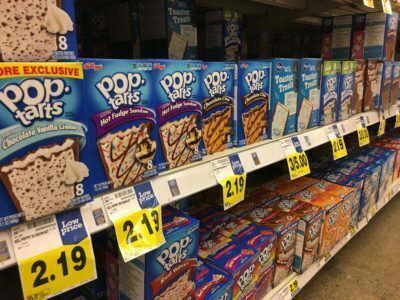 It is my hope that the review will encourage hikers to be more aware of the foods purchased as not all are created equal. If commercially prepared foods are so inadequate, what should I do? This is when homemade trail food can be considered. Contrary to popular belief homemade trail food can be made to be high calorie, lighter weight than commercially prepared food, significantly less expensive and prepared in a minimal amount of time. Each of these will be discussed in detail within future posts. Preparing a 5000 calorie meal plan can be done within the two pound weight goal. I will share with you how! Backpacker’s Pantry Katmandu Curry: 640 calories (109 kcal/oz) for $9. Homemade Wasabi Pad Thai: 1248 calories (155 kcal/oz) for $2. Why such dedication to ultralight meal planning? As mentioned in my bio, I have a history of being an endurance sport athlete to include open water swimming, triathlons and ultra trail running. Consuming adequate nutrition to maintain weight and strength has always been challenging as consuming 5000 calories per day is no easy task. My body is incredibly sensitive to inadequate calorie intake so much so that it will certainly end my trek early. I begin to struggle physically, then feel a little grouchy (aka “hangry”), then emotional including unexplained crying spells followed by my body completely shutting down and unable to continue moving forward. The progression occurs within a short period of time. As a dietitian, it would be disappointing to be forced off the trail early because I didn’t meal plan well enough. Thus, this is the reason why I have such an interest in ultralight meal planning.